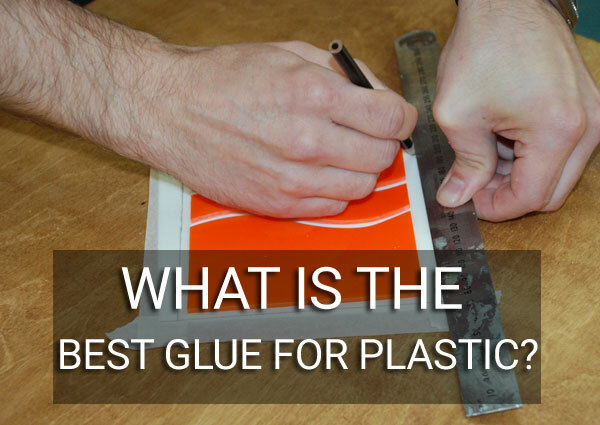 What is The Best Glue For Plastic in 2019? Here are seven of the best glue for all kinds of plastic and many of them strongly bind other materials too. J-B Weld and UV Plastic bonder are two types of welding glues. Before you start gluing any type of plastic whether it is hard plastic on your car or the plastic of a child’s toy, you should learn what type of plastic it is and choose the right glue. Each type of glue has instructions for the correct application and curing time. If you do not follow the instructions accurately, you will not get the results you want. The most popular plastics used for commercial and residential use are polystyrene, PVC, Plexiglas, and polycarbonate. It is easy to bond the same kind of plastic together with the right adhesive, but it may be difficult or impossible to bond different types of plastic no matter what glue is used. The Gluesmith system comes with everything you need, including thick and thin adhesives, two structural composite fillers, the booster with spray top that promotes fast curing and two micro applicators to allow for precision application. The booster increases drying time for gap filling and bonding and as a primer for hard-to-bond materials. The bottles come with a coating that helps prevent drying and clogging. Gluesmith plastic repair system is suitable for a wide range of surfaces, including hard-to-glue surfaces like polypropylene, polyoxymethylene, and polyethylene. It provides a powder and activator for these surfaces. Gluesmith has a two-year shelf life and if kept refrigerated it will continue to work well for up to five years. Originally designed for non-porous surfaces, it works well on all materials. Therefore it will be a good option for clothing, arts and crafts, wood, stone and just about everything else. The thin glue is for quick repairs on non-porous materials. You can use it to build, reinforce or fill when you mix it with the polyfiller. It will instantly become super hard and can be drilled, sanded, painted and machined. It is suitable for surfaces that support a lot of stress. 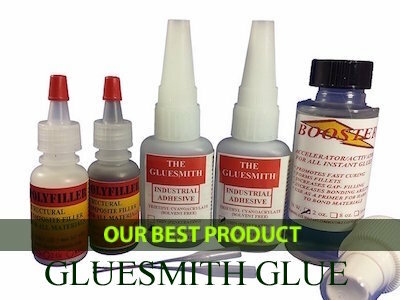 With Gluesmith, you will not need to wonder which glue to use for marine, automotive, motorcycle, and ordinary everyday applications because it works on all of them. The thick product does not drip and gives you time to make adjustments before the glue sets. When you have positioned things the way you want, just spray the accelerator on the glue and it will set immediately. If you need heavy-duty glue for your car, RV or motorcycle, Gluesmith Plastic Repair Glue System may be a good choice. With the filler, booster and thick and thin adhesives, you can create the glue you need for different applications. Q: Can I use this to repair a cracked ice chest? A: Probably not. Most are polyethylene, a very slippery plastic like a milk jug. If it is any other material, it may work. Q: Do all five products come in the Kit? Loctite Liquid Professional Super Glue comes in a single, four or twelve-pack package and has a long nozzle for precision application. It has an extra strong formula and is suitable for tough repairs. So it bonds most plastics as well as glass, rubber, ceramic, fabric, metal, wood, Plexiglas, polycarbonate, polystyrene and PVC. In addition, Loctite has low viscosity and is a good solution for bonding close-fitting, smooth surfaces. The cap screws on and pierces the opening so it may not clog. However, several people report that the cap can become glued shut. You can use it repeatedly if you keep it tightly sealed and store it upright in a dry location. 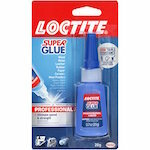 Loctite has made advanced adhesives and sealing products for industry and individuals. It is stronger than most super glues because it has a patented additive. It works well even in harsh conditions such as freezing temperatures, rain, and contact with most chemicals. You can use it for some automotive issues such as rubber seals, metal car parts, wiper blades, and O-rings. Loctite dries transparent and sets in just a few seconds. 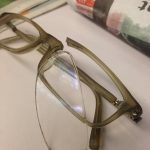 Some of the people who have used Loctite Liquid Professional Super Glue have successfully repaired a charcoal grill knob, shoe heel, reading glasses and even a wound on a dog, but sealing a wound is a personal decision and not a suggestion. Q: It this the best glue for a porcelain figurine, the head broke off? A: I think this would be a great choice for porcelain. I used it to repair the handle of a cup my grandmother gave me. Q: The screen on my phone is popping would this help? A: I think it would. However, read on the package about materials and safety. 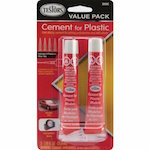 The Value Pack contains two tubes of this cement for plastic. First of all Testors Plastic Cement is one of the best glues for joining polystyrene and ABS plastic. You may use it mainly for model kits and household items. It comes with four precision glue tips to make working on models easier. When you twist each tip on the top, you will have a precision cement applicator. If you enjoy DIY projects, model building or other craft projects, you may find the precision glue tips convenient. The glue actually fuses two plastic pieces together. The bond is so strong because the glue chemically melts one or both surfaces that you want to join. This may make the finished piece a bit shorter than the combination of the two original pieces. If you are making a model, you may want to be aware of this, or a specific piece may become shorter and not fit in its place properly. If you are using it for board game pieces or Legos, it will not change the color of the plastic as some superglue does. While this glue works well on plastics, it may not be a good choice for fiberglass, spandex, faux-leather, rubber and hard surfaces such as wood, stone, and brick. It may work well for arts and craft projects and scrapbooking. If you use the right amount for each piece you are gluing, it makes a strong bond, but if you do not use enough it will not hold for long. When using it for the first time, you should take care to find out the exact amount needed for specific surfaces. Testors Plastic Cement has a strong odor so you should use it in a well-ventilated room. Also, it does not dry quickly, which may be good if you need to adjust your pieces, but otherwise, you may need to clamp your pieces or hold them until it dries. Q: Will this product work well on Lego’s? A: It will but be aware that it works by chemically melting the surfaces to be joined, allowing them to be truly melded instead of just glued. Q: Would this work to secure the spandex-type fabric in a light color to faux-leather shoe? 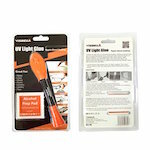 UV Light Glue Kit has the glue and the UV light in one small container. It also comes with two alcohol pads for cleaning the surfaces to be glued. It is not normal glue in the sense that it needs exposure to a UV light to set. Once it is set, it creates a permanent bond. If you are looking for the strongest glue available for small plastic parts that require extraordinary strength, this may be your best option. It will repair plastic, wood, metal, glass, stainless steel, AVS, PVC, ceramic, acrylic and more. You can use it to repair valuable jewelry because it creates a permanent pond in five to 10 seconds. It comes with a preparation pad that you use to clean the surface to be bonded. Since it only hardens under UV light, it is much safer than superglue if you accidentally touch it to your skin. After it hardens, you can sand, drill and paint it. Furthermore, it’s heat and water-resistant and dries clear. The container that has the UV light and glue will fit in your pocket so you can take it anywhere. The formula is safe and not hazardous. It is environmentally safe and passed the European Union 174 Product Testing. The kit contains the glue pen, the alcohol preparation pad, the UV light with a battery. Once the battery is finished, it cannot be replaced and you need to buy another kit. Q: Would this work on a crock-pot lid? A: I have not used it on a crock-pot lid. This stuff has been amazing, just not sure about something that will have steam and heat hitting it. J-B Weld Plastic Bonder with two in a pack. The two parts are in separate parts of the container and you push out the correct amount of each part to mix. 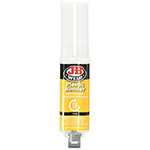 J-B Weld Plastic Bonder provides a system of urethane adhesive and comes in two parts. It binds thermoset, coated metals, concrete, thermoplastics and more. The mixing ratio is 1:1 and it sets in about 15 minutes. You can sand it after about 30 minutes. Since it dries tan, so you may want to use it on places you plan to paint. If it is a black surface, you can cover it with a permanent black marker when it is dry. It works on automotive applications, ceramic, brick, PVC, fiberglass, and wood. It will hold automotive trim, composite panels and exterior and interior plastic parts. You can use it for filling dents. It creates a hard, permanent bond. Reviewers say they get good results with this glue on laptop frames and other plastic handles or latches that need repair. One idea is to mix it in the corner of a plastic bag. You can mix it without air bubbles and when it is ready, you can cut the bag and use it like a frosting bag. Q: Will this work on HDPE? A: I used the glue on High-Density Polyethylene speaker mounts in a Corvette restoration project. J-B Weld was easy to work with. Q: Once opened does the glue dry out before you have a chance to use it up? A: No, it does not dry out so long as you keep the cap on the tub ends. I have kept it partially used for months. 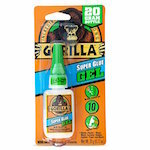 The Gorilla Super Glue Gel, 20 grams has one bottle in the package. It claims to make long-term repairs quickly, does not run and dries clear. 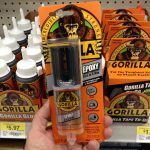 Gorilla Super Glue Gel dries in about 10 to 45 seconds and bonds plastic, wood paper, ceramic, metal, rubber, paper leather and more. The best feature is it does not run so it is especially good for vertical surfaces. The cap has a metal pin that keeps the glue fresh and ready for the life of the container. It is made with tiny rubber particles that help increase its strength and impact resistance. 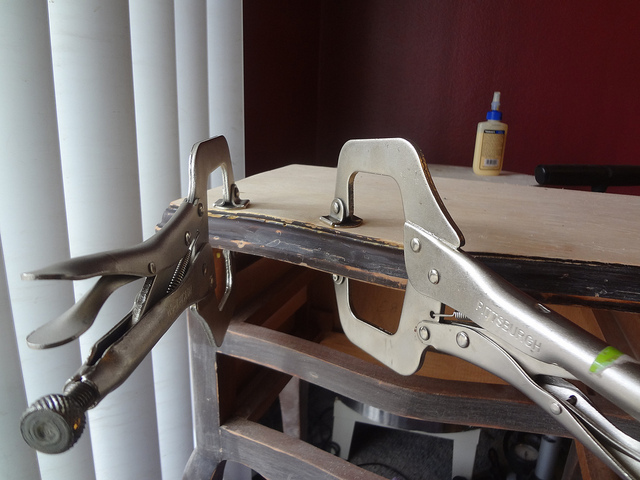 Since it dries so fast, you never need to use clamps. It holds broken rearview and side mirrors and you can also use it to repair a damaged wooden dresser. Glue gel formulated to hold through impacts, drops, and shocks. Not recommended for use on polypropylene or polyethylene plastic! Q: What is the difference between their super glue gel and their super glue? A: Gorilla Super Glue Gel is a thicker consistency that is perfect for applications on vertical surfaces. Gorilla Super Glue will have the same holding power. Q; Is Gorilla Super Glue Gel waterproof? Trying to glue metal trim to automobile plastic tail light. A: Sort of. It is initially waterproof, but over time if exposed to moisture it certainly will fail. That’s my experience. Amazing GOOP is suitable for repairing both upholstery and the coating on battery terminals. 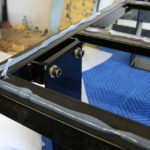 It will attach loose trim and bonds with metal, vinyl, leather and glass. It will seal convertible tops, lights, seats, mats, handles and trim and yellow: withstands heat up to 150 degrees Fahrenheit. If you clean the surface with alcohol first, it will bond surfaces such as car moldings and even car emblems on the front. It is the strongest single-component adhesive available. Amazing GOOP remains flexible when it dries and is UV resistant, which means if you use it on the outside of your vehicle, it resists yellowing and cracking even when exposed to long periods of direct sunlight. The flexibility also makes it suitable for places that vibrate. This glue is waterproof and dries clear and is an excellent sealant inside and outside your vehicle. It seals hose leaks, tread and is better than silicone to block corrosion on battery terminals. GOOP will also insulate electrical wiring. If you are looking for a glue, sealant or insulation for any part of your vehicle, Amazing GOOP may cover all your needs. Q: Can you glue car molding on? A: Yes. I had good luck with this. It is good for bonding surfaces that are different. I’d use rubbing alcohol on the surfaces first to clean them. Q: Does it come with an applicator? If not, how do you apply it to a surface? A: I used it to repair a tear in my carpet and it has held for over a year. It has no applicator. I applied it with a small strip of wood. The above glues are the best on the market today for binding different kinds of plastic. The Gluesmith Plastic Repair System is number one for a reason. The package has adhesives and fillers that may solve any problem as well as the spray booster to harden the glue instantly. Welding glues are becoming popular in the automotive industry for attaching racks, window glass, flooring and more. 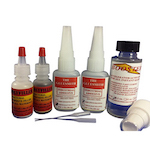 J-B Weld, Testors Plastic Cement, and UV Light Glue Kit are welding glues you can use at home. Loctite Liquid Professional Superglue has the advantage of low viscosity so it is easier to use than some superglue that is thin, and it has a patented additive that makes it stronger than other super glue. If your needs are automotive, Amazing GOOP may be the best option because it covers a broad range of needs. The future of glue is bright. From biomimicry to fashion glue is revolutionizing many industries. Consider the lowly slug. Based on slug slime, scientists have developed a glue that may be useful for repairing wounds in the skin and internal organs, which means no more stitches. It is about 10 times more powerful than anything on the market today and can be strong or flexible, which makes it useful for children. 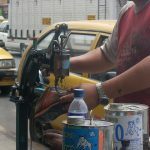 Along with high-end streetwear, other clothing using glue instead of stitching are t-shirts, shorts, underwear, and jackets. Top brands such as Nike, Victoria’s Secret and more are using glue to connect fabric, incorporate features such as patterns and pockets and create hems. Called Sewfree Bonding, it originated at Bemis, a small company in Boston. Airplanes, cars, and appliances are constructed with glue. Even architects are looking to glue for the future of construction. With glues that strengthen plant cells, wooden skyscrapers may not be far behind. If you have broken plastic, the first thing you should do before buying glue is to determine the type of plastic you need to bond. Then, you can choose the best glue for the above selection.